Donald Fagen and Walter Becker are the snarky, cantankerous pop wizards behind Steely Dan, and are thus responsible for some of the most enduring American music of the last half century. The duo brought a terrific large band to the Santa Barbara Bowl for last Wednesday night’s show, which neatly bridged the week between their two well-publicized appearances at Coachella. Early on in a nearly two-hour set, Becker proclaimed the band’s touring mission—to “bring back music that makes people feel good.” While this remark was clearly directed at the multitude of baby boomers in the audience, many younger music fans in attendance visibly shared the sentiment. With the musical highlights coming virtually non-stop, it’s the quirky moments that stood out, like Donald Fagen taking a melodica solo, or Walter Becker pulling a Garrison Keillor in the middle of “Hey Nineteen” with a story about a hypothetical couple heading back to party in Montecito after the show. With the exception of a Joe Tex cover, “I Want To (Do Everything for You) that served as a platform for Becker to introduce the band, the songs were all originals, and, with the other exception of “Godwhacker,” from 2010’s Everything Must Go, they were all drawn from the band’s initial run of classic albums. 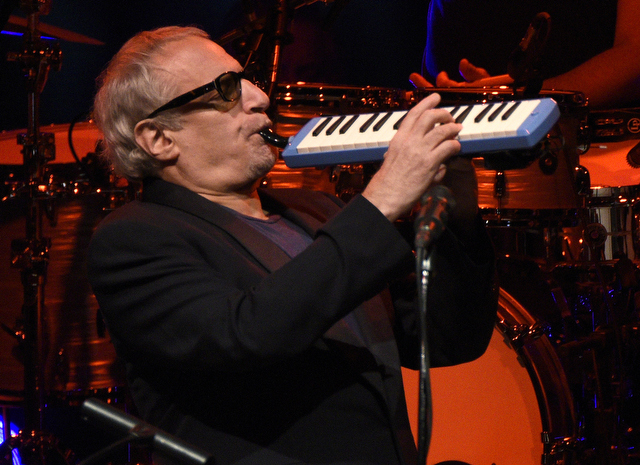 We heard more than a dozen of them, including “My Old School,” “Kid Charlemagne,” “Peg,” “Reeling in the Years,” and “Aja.” These songs may be old, but with Steely Dan’s consummate musicianship and clever, artful arrangements, they remain hip.